Everyone talks about parity in the NFL, but history still loves to repeat itself. Whether it's the Giants annual late season swoon, or Tony Romo choking in a big moment, some things just seem to remain constant. Lets just go out and get Eli's arm healthy, get some guys that can defend a pass and stop the run and we'll be good to go. Oh. Maybe rush the passer some too. A whole new D? Sigh. Sad how far they've fallen. Andy headed to KC. Guess he wanted that number 1 pick. And we will get to look at the walrus on the sideline for another season. what's that say about his thoughts of going out to AZ to coach Kolb...? Cheifs with a great singing in Reid ... the man can draft his own team and hopefully make the cheifs the team they were a few years ago. Eh. Now Charles will go to waste. Thats the assumption, I personally think Reid will trade down and draft Joeckel or Lewan. And then hopefully try and pick up Barkley in the 2nd. Unfortunately I think Barkley is going to have a great combine so Reid may have to do some of his trade magic. Shanahan is just killing RG3. Disgusting to watch. At this rate he's not going to last very long in this league. It'll be another Michael Vick story where the guy is missing a handfull of games every year and never fully healthy. wait... you mean that's NOT why they drafted Cousins?!? I have no idea why they had him on the field for as long as they did. Start him? Sure I'm ok with that. When the guy starts limping heavily? Take him out. It's not like it's his last run for a title. Also. What the heck was with the field? Horrible conditions. 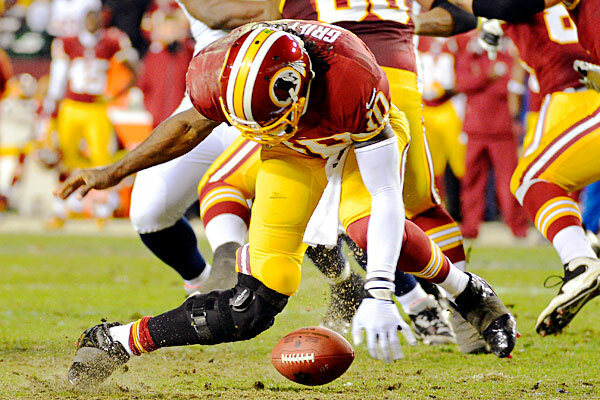 I have no doubt it contributed to RGIII's knee and also hurt Clemons for the hawks. Embarassing day for the skins IMO. If it's a PCL to go along with the ACL, he could miss the entire 2013 season. It's a shame because he's an exciting young player, and seems like a good kid. Shanahan and that organization drove the kid into the ground in his rookie year. Not only the decision to put him back on the field with a bum leg, but allowing him to run that option offense to begin with. You'd think they'd learn from Vick and Eagles that running QBs don't last very long in this league. If this injury is as serious as it sounds, the Redskins are going back to the basement of the NFCE for another decade. Take away RG3's mobility, and you have a very average QB. They'd have to dump the read option and teach him to be a pure pocket passer. Not to mention they don't have a first round pick until 2015. In a nutshell - The Redskins have turned this feel good rookie season into a tragedy. The Rob Ryan firing was a bit surprising. Prior to being hammered by injuries, they were a pretty good defense. I love Jerry Jones for keeping his team down. Instead of blaming his QB and special teams for the losses (he apparently points to the Chicago and Seattle losses as key reasons for firing Ryan) he blames the defensive coordinator. Really? Dallas had 7 turnovers between those two games and he expects a defense to hold? I've missed Al Davis' zaniness and unpredictability. I never thought he'd take control of Jerry Jones and destroy the Cowboys.